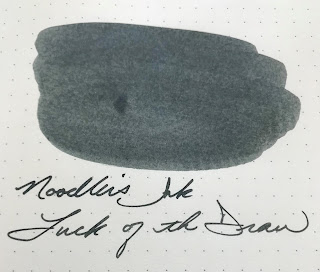 Hello fellow fountain pen peoples. I was thrilled to get my hands on this ink which was made for the Baltimore Pen Show for 2018. 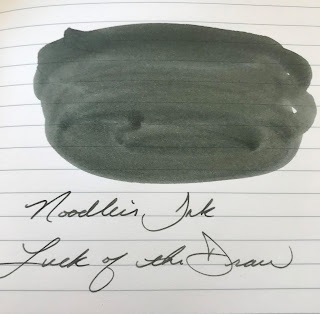 As many of you know, I do love Noodler's ink. This color is quite intriguing. 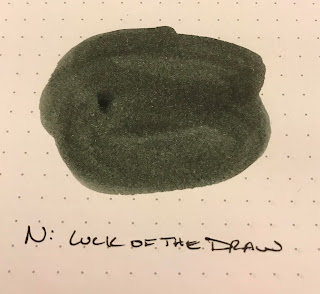 It is a muted dark green/grey color that does shade nicely and is water resistant. 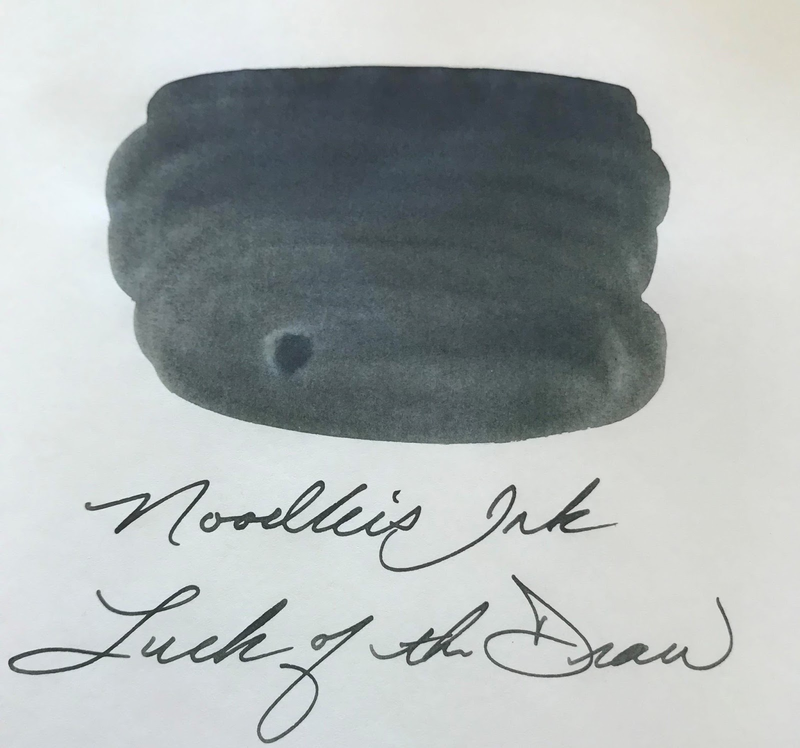 As with a lot of Noodler's inks, there is a story behind the color and label but Nathan Tardif has not disclosed it in this case. 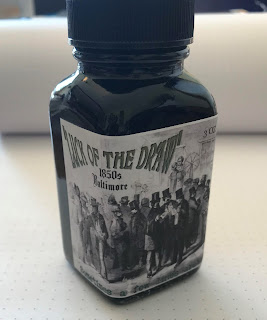 The label denotes 1850's Baltimore on the label so I took to doing some research. What I found was interesting. It seems to be tied to pre-Cival War Baltimore, where the ruling party were Democrats and were primarily Catholic Irish. The working class was primarily German. The American Party (Know Nothing) came to power by using violence at the polls to keep Democratic voters from the polls. The American Party began to try to upgrade the water system and professionalize Police and Firefighters, which are noble endeavors. The Irish and Germans revolted and brought the American Party down. 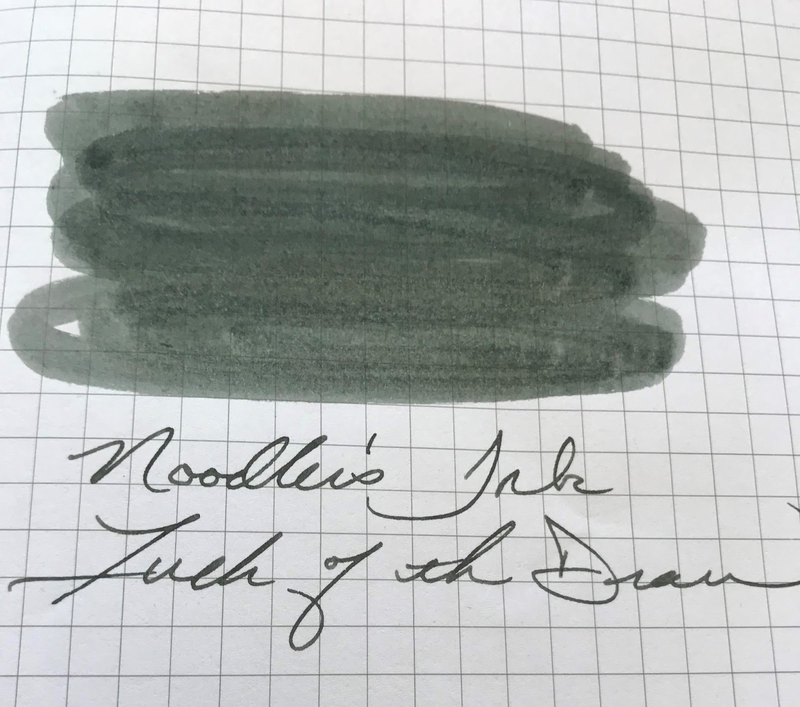 I may be off base, but to me, the ink color matches that assessment. 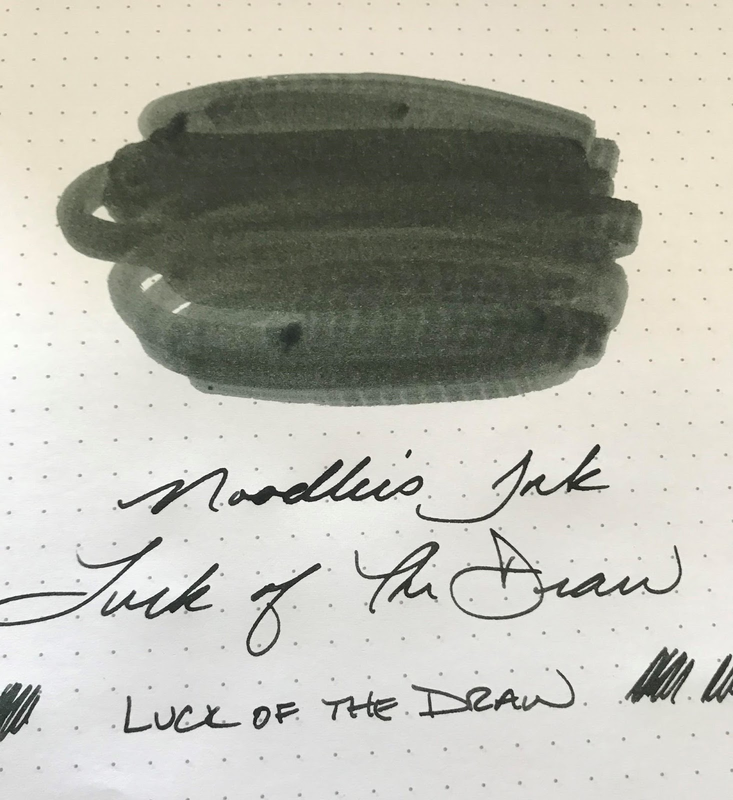 Ok, let's talk the ink itself. 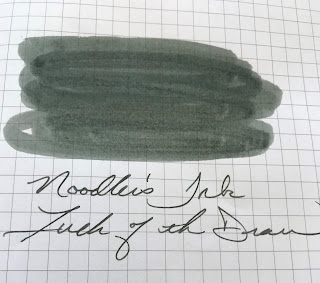 It is a nice dark green grey color. It really swabs out to more of a muted color but the writing actually has some nice shading elements and some decent saturation. Some papers tested bring out more of the grey aspects of the color and others have a nice blend of the green and grey. The Tomoe River really was my favorite looking of the tests. The ink behaves nicely from the tests shown. I did not see any bleeding, feathering or spread and the flow is moderate to wet. 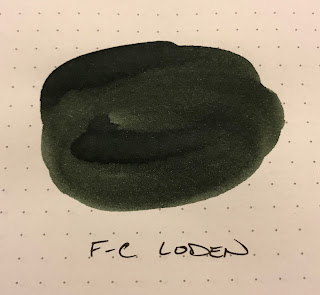 I wanted to see if I had any oddly colored green inks to try to compare to this one and Franklin-Christoph Loden is the closest. 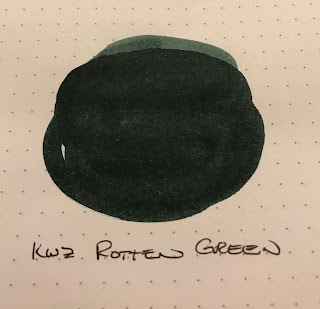 KWZ Rotten Green is quite nice but is a different mix of green and grey altogether. Loden is more of a rich brownish green than a greyish green but are close enough to be similar at least. Overall, I really enjoy the color and the ink. I am very happy I made the purchase. This review is based off of my opinion and experience. I do not represent Noodler's Ink nor am I being compensated in any way. Glad you liked it. 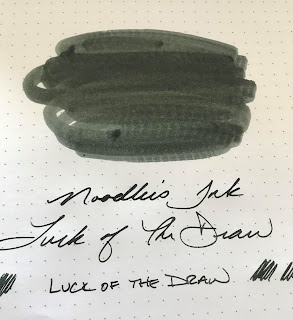 I must say that the more I write with it, the more I really love it.